When it comes to your digital tools, we know ease of use on any device is essential. That’s why we are launching the new and improved MyHealth OnLine. It’s streamlined to help you take steps that make managing and understanding your benefits easier. What has changed in MyHealth OnLine? We reorganized content by listening to you, our members. We took the tools you used most and made them easier to find and use. An easier-to-use Find a Provider tool. Improved access on mobile devices. To get familiar with how to find our most used tools, download our MyHealth OnLine quick reference guide. What has stayed the same in MyHealth OnLine? Although much about this members-only website has been upgraded, we kept all the convenient functions that let you manage your benefits, contact member services, and learn more about your coverage. Download your member ID card. Live chat with Member Services or a health coach. Pay your bill and review your claims. Estimate the cost of treatment options. 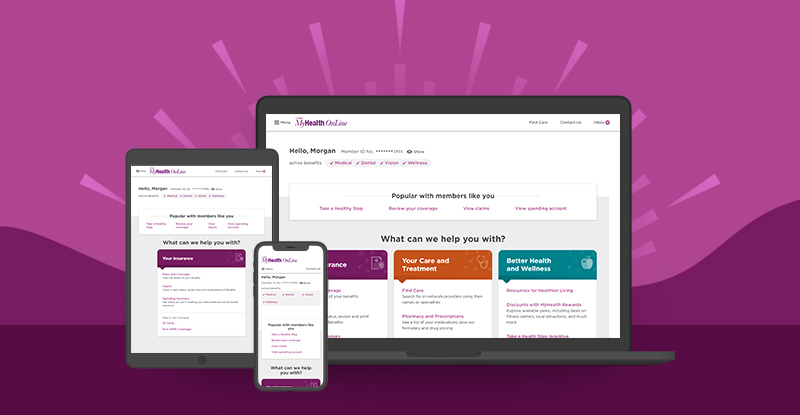 Whether you can’t wait to see the new experience for yourself or have been meaning to make an account, now is the perfect time to log in to or register for MyHealth OnLine.